res•pite/noun – an interval of rest or relief from something difficult or overwhelming. We equip families and communities to engage in healing children from hard places. Scroll down to register for upcoming events and SAVE THE DATE – Oct 12, 2019 for the next Annual RESPITE Conference! Click on any of the buttons below to register for our upcoming events! 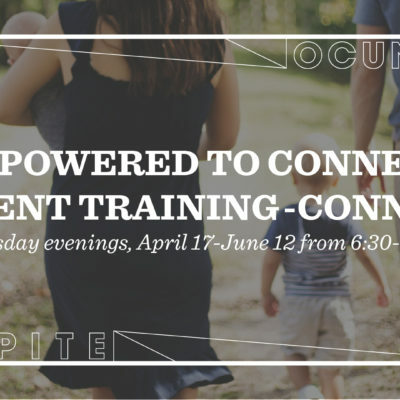 Empowered To Connect (ETC) Parent Training – designed as an interactive learning experience specifically for current and prospective adoptive and foster parents. The CONNECT Course (9 weeks) and PREPARE Course (6 weeks) in an interactive small group environment that meets weekly for about two hours. Created to Connect – Twelve-week study of The Connected Child with a Christian & biblical perspective. Intended for any caregiver in the life of a foster or adoptive child. 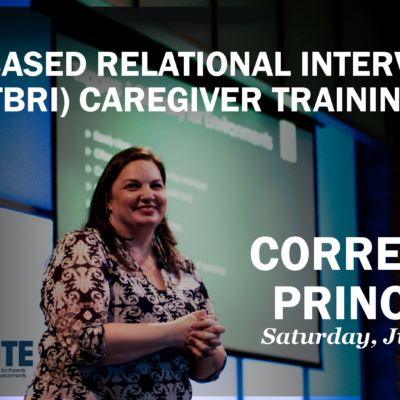 FFA Parent Training – 8-hour ETC Workshop for Foster Family Agencies to introduce TBRI principles to parents. Parenting Workshops – Training on specific topics to build strong families and healthy children. Kids Yoga Class – Trauma-Sensitive Holy Yoga class for children from hard places. All Intersections Yoga Class – Trauma-Sensitive Holy Yoga class for anyone intersecting with the care of Foster, Adoptive, and Kinship children to address caregiver stress and secondary trauma. Family Wellness Workshop – Introductory workshop class for parents & children in Foster/Adoption/Kinship families. 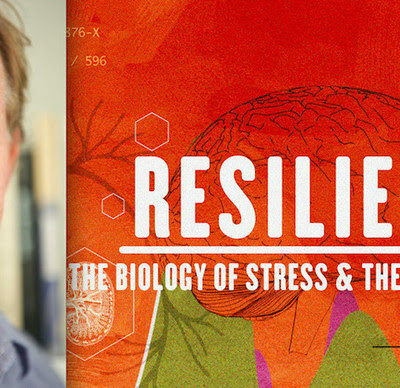 Highlighting Wellness and Resiliency skills for families. 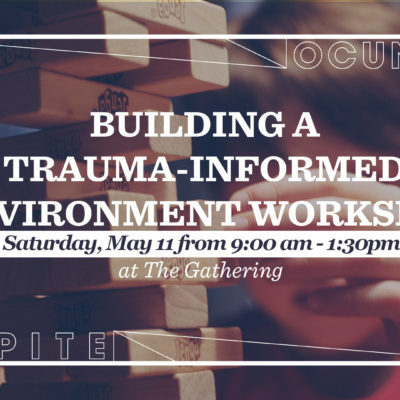 Caseworker/Therapist/Caregiver Workshop – Introductory trauma-sensitive workshop class for caseworkers, therapists and caregivers who support Foster/Adoption/Kinship families. Resource Line – Available for in-person/telephone/FaceTime support to families in crisis. Providing resources, compassion, tools & nurture groups for families. Parent Mentoring – Linking parent mentors and mentees to provide one-to-one support. 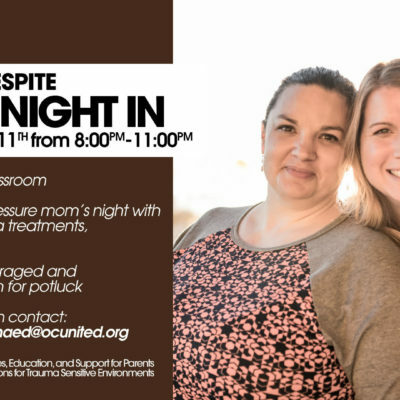 Parent Connection Night – Nights out (childcare included) with brief Educational components to connect parents to spouses and others in the community. Online Community & Education – Providing resources, tools, discussion, and education for families in an online community group. Resource Library – Books, Videos, and other educational material to Parents and Caregivers to support parenting and healing process. Support Group – Regular educational and support group meetings for caregivers, childcare included. Children’s Ministry Trauma -Informed Training – 2-hour Trauma-Informed Care training for Children’s Ministry programs to introduce TBRI principles. Friends & Family Training – Short training to introduce ETC & TBRI principles to Friends and Family of families with kids from hard places. Building Trauma-Sensitive Classrooms Workshops – Workshops and in-service trainings for Educators and Administrators to review Trauma-Informed principles and provide tangible and practical interventions in classroom and school settings. Equipping After-School Program Trainings – Workshops for After- School Program Administrators and Facilitators to learn Trauma-Informed principles and provide practical interventions in classroom & school settings. Local Classroom Support – Provide classroom supplies, intervention “cheat sheets,” and Trauma -Sensitive resources (i.e., fidgets) for teachers of kids from hard places. 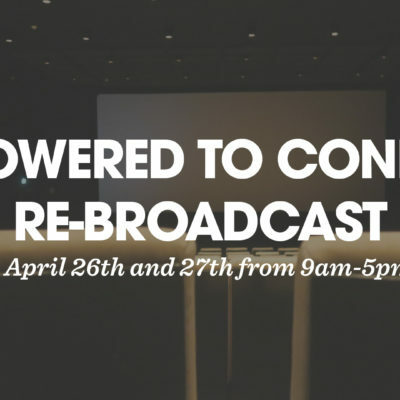 Community Education Opportunities – Simulcast Conferences, Panel Discussions, Film Screenings and Info Meetings to inform, educate, and engage community members and organizations in the mission of supporting the families of children in out-of-home placements.